As I endeavor to assemble an 1890s playset, I’ve found a few instruments that are lovely to behold; this is one of them. This rut niblick dates likely to the late 1890s and retains many “original” components, although I suspect they were separate components once. 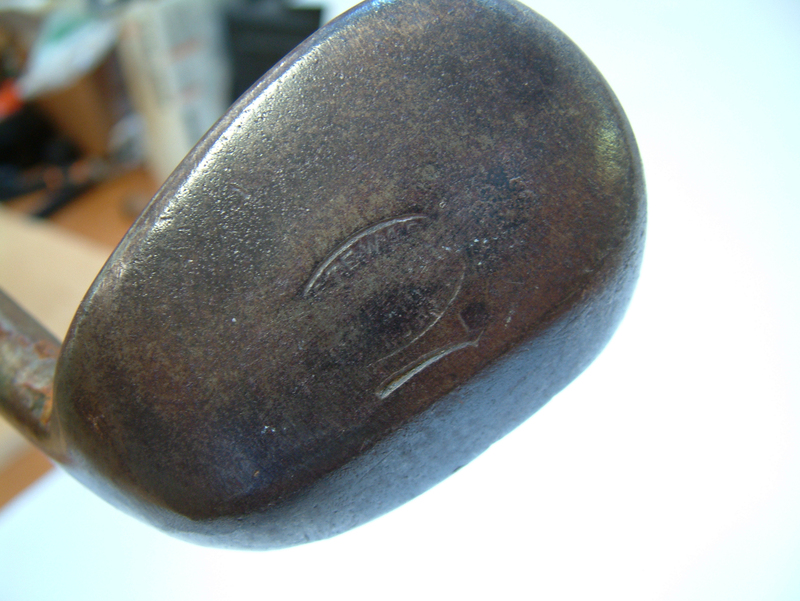 It has a nice, straight and strong shaft stamped “R. Hepburn, Maker, Royston” (see below for more about Hepburn), original sheepskin grip and the head bears the name Tom Stewart, St Andrews, with the now famous pipe cleek mark. There is a fair amount of shellac (?) on the shaft, I think the sellers didn’t realize there was a stamp in it. The club has a loft of about 50-degrees, generous sole, given the small dimension of the entire head, and a nice patina throughout. The reason I believe that the components were separate is because the hosel nicking may be indicative of a later re-shaft. 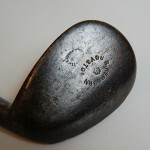 Stewart made clubs beginning in 1893. Hepburn was at Royston Golf Club no later than 1892 (possibly earlier – the club simply didn’t formally incorporate until 1892 – the course was laid out in the late 1860s). I am planning to preserve the grip, if possible, and affix a period-appropriate hide with 1.5 mm of underlisting. This is going into a playset; long may it live! 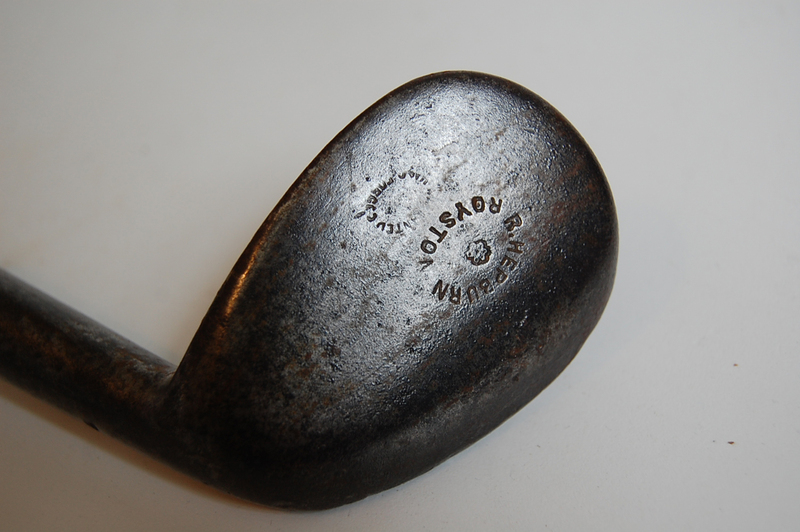 Stewart, of course, was born in St Andrews in 1862, made irons with his own name on them and, indeed, for most of the top makers and players of his time. 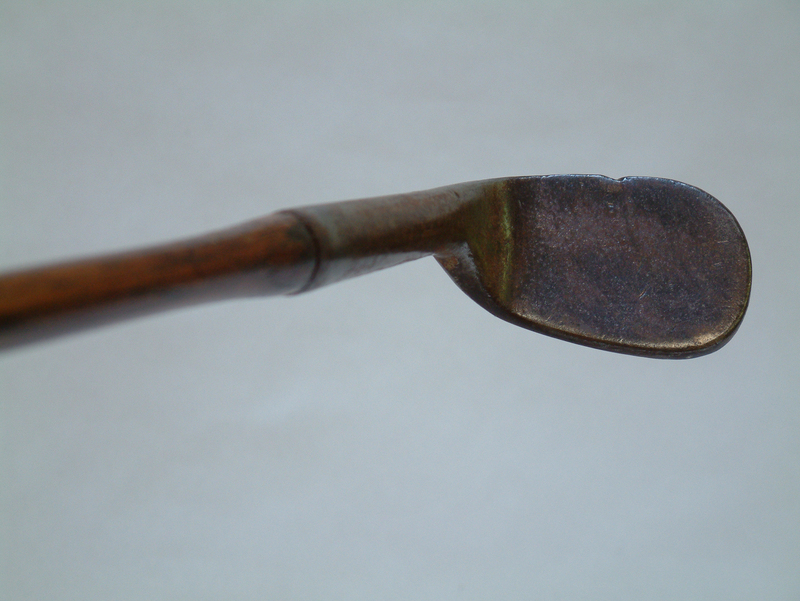 Stewart was one of the most respected club makers in Scotland and his early irons were used by Tom Morris himself. He served an apprenticeship with Robert White and started in business on his own in the mid-1890s in Market Street, St Andrews, but also took over premises in The Pends where Robert White had his business. For quite some time irons were forged in The Pends then taken across to Market Street for finishing. St Andrews is not huge but that could not continue as the business expanded so he took premises in Greyfriars Gardens before moving to the address in Argyle Street where the business remained until his death and beyond. His own maker’s mark was a clay pipe but you will also see a stylized spider-like star on heads which he himself rejected on grounds of quality but sold on to other makers. 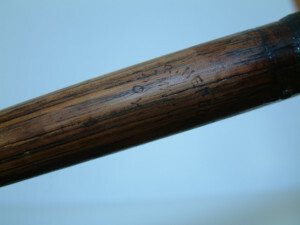 Importantly, in 1905 he registered the pipe mark as a trademark and post-1905 clubs contain this trademark information below the pipe. 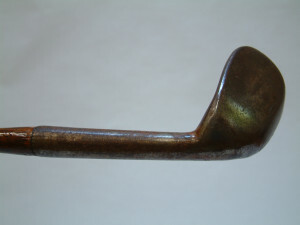 His “early” clubs are grouped in the years 1893-1904. In addition to his clubs his patented iron hole liners and cups were used on the Old Course at St Andrews. The story of Royston Golf Course is a magical one. Set out originally in 1869 by Lord Dunedin and George Gossett (son of the founder in 1864 of Westward Ho Golf Club) accolades for the course go far back. The Club was officially instituted in May, 1892 and had 240 members. Robert Hepburn was the professional at that time, who also held the “green record” of 74. Incidentally, at the same time, the amateur record was 75! 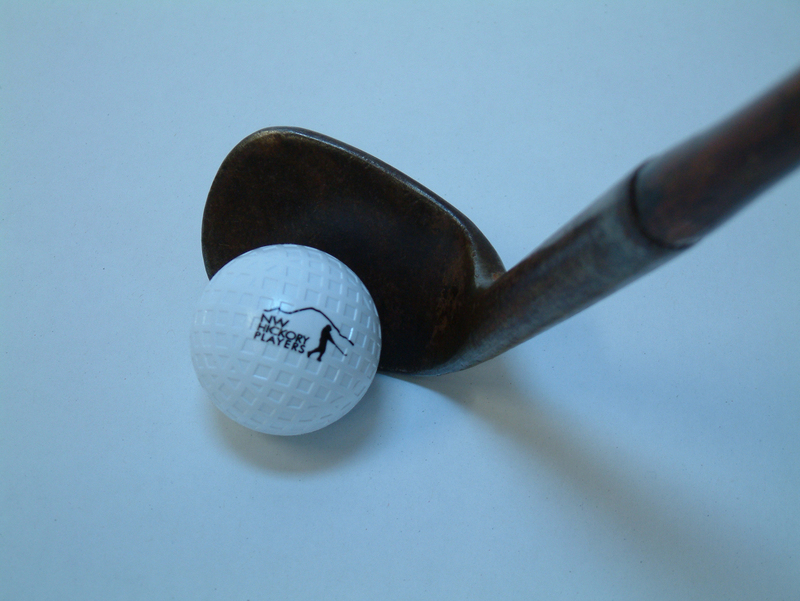 Robert’s brother was James Hepburn, born in Carnoustie in 1876 and an original member of the PGA in 1916. In 1914, James moved to the US to become golf pro at National Golf Links in Southampton, NJ. Scottish Team in 1903 (Prestwick) (standing) R. Smith, G. Coburn, J. Braid, R.Thomson, W. Park, W. Fernie. (seated) J. Kinnell, J. Kay, A. Herd, J. White, B. Sayers, Robert’s brother J. Hepburn, The team included five Open champions. 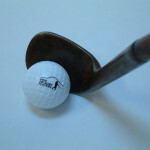 Lord Dunedin and George Gosset both very keen golfers who came over with a bag of clubs each and set about arranging their golf course by establishing the holes by position and distance according to their striking of golf balls. A simple but effective basis which was helped by the fact that the heathland was all close cropped grass. This course unfortunately only lasted about two years when in 1871 it was felt that Royston was too far from Cambridge. However in 1890 the idea of a golf course on the Heath came to the fore again. This time it was with the encouragement of the Conservators and the help of two gentlemen from the now formed Cambridge University Golf Club. The course that was designed followed much of the original eighteen holes set out in 1869. 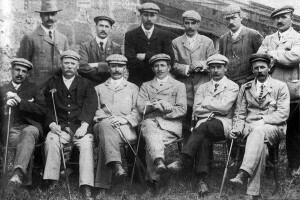 This was the prelude to the establishment of Royston Golf Club on the 1st May 1892 and although there have been several changes to the course in the last thirty years, mainly to increase the length and avoid playing over a road, every effort has been made to preserve its character. The course lies within an SSS (Site of Special Scientific Interest). Working with Natural England and the Conservators, Royston Golf Club is at the forefront of Heath management, for the benefit of all. A significant part of the Club’s involvement is the preservation of the natural features of the heath for the public good. Therfield Heath is well known for its flora especially the wild orchids. In the early spring the south facing side of the church hill is covered with the purple Anemone Pulsatilla, or Pasque Flower, which according to folklore only grew where Danish blood had been spilled – this is the largest colony of wild Pulsatilla in Europe.